Arguably the most important safety feature on your vehicle, brakes use fluids and friction to bring you to a safe, sure stop. However, constant stress and heat can wear down individual components and affect your braking feel and stopping distances if not quickly serviced. Here we’ll do an overview of the brake system repairs we can perform for your Kia or any other brand of vehicle sold in Canada. To schedule brake maintenance for your car, truck, or SUV, please call our Mississauga car dealership service team at 1-888-651-1987 or book online using our handy online form. Having your brakes inspected not only brings peace of mind (particularly when there seems to be a change in braking operation), but will also save you money in the long term by preventing support parts from getting damaged and prematurely failing. Brake fluid allows the pressure from your foot to transfer all the way down the lines to initiate your brakes and make a safe stop. 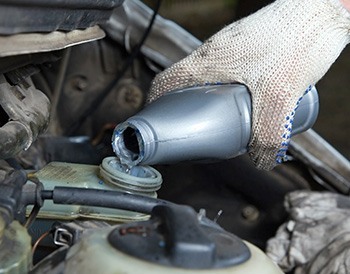 But constant heat, pressure, and moisture reduce the effectiveness of your brake fluid over time. The ABS (anti-lock braking system) on your car prevents the wheels from locking up so that you can maintain handling control under hard braking or slippery conditions.